Dimensions 0 by 8.30 by 10.80 in. Human beings are extraordinary creatures. Intelligent, agile, and curious, we have adapted and invented our way to becoming the most important species on the planet. So great is the extent of our influence, that many speak of a new geological era, the Anthropocene, an age defined by human-induced change to the blue and green globe we call home. Our lofty status comes with responsibility as much as possibility: How should we approach our present and future? What knowledge should we carry with us? 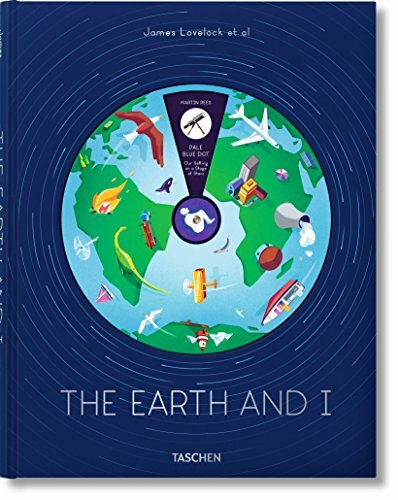 Conceived by James Lovelock, inventor of the Gaia theory, this illustrated essay collection brings together an all-star line-up of thinkers and scientists to offer essential understanding about who we are, how we live, and where we might be going. Much as the Gaia theory considers our earth as an integrated whole of living systems, The Earth and I encourages holistic understanding. Across 12 chapters, we take in both the intricate details and immense structures of our species and our planet, from our ever-expanding universe to our minuscule but mighty cells. We see stellar explosions and the layers of life beneath our feet, delve into the neuroscience of decision-making, get to grips with our climate, and contemplate our increasing intimacy with technology. The bookÃ¢ÂÂs world-class contributors include quantum physicist Lisa Randall, Astronomer Royal Martin Rees, Pulitzer Prize-winning biologist Edward O. Wilson, and Nobel Prize-winning neuroscientist Eric Kandel. With lively illustrations from British artist Jack Hudson, the result is an inspiration for curious minds young and old, and a trusted tool kit for an informed and enlightened future.